This summer I will be teaching a summer course entitled Introduction to Computing for the Study of Complex Systems at the ICPSR Summer Program in Quantitative Methods. For those not familiar, ICSPR has been offering summer classes in methods since 1963. The Summer Program current features dozens of courses including basic and advanced econometrics, bayesian statistics, game theory, complex systems, network analysis, quantitative analysis of crime, etc. 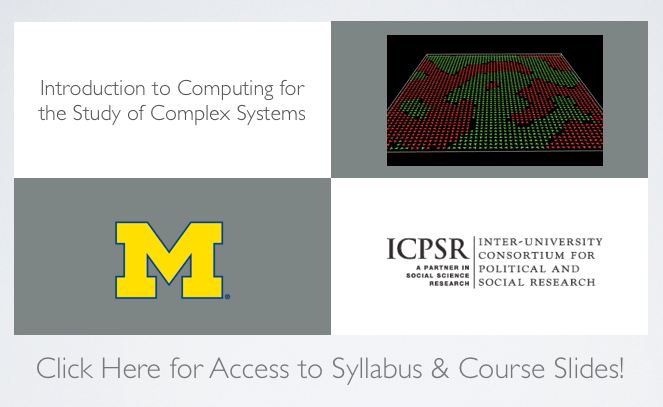 The Complex Systems Computing Module runs together with the Complex Systems lectures offered by Ken Kollman (Michigan), Scott E. Page (Michigan), P.J. Lamberson (MIT-Sloan) and Kate Anderson (Carnegie Mellon). Here is the syllabus for the lecture. The first computing session is tonight from 6-8pm at the ICPSR Computer Lab. If you click here or click on the image above you will be taken to a dedicated page that will host the syllabus and course slides! Note: The slides and assignments will not be posted until the conclusion of each class. I attended this course in the summer of 2002, it was really interesting although, in my feeling, a bit far away from actual problems in the social sciences. It is great to see that, at least in the syllabus, the content now includes a lot of applications together with the contemporary theory. A step in a definitely right direction.